The modern periodic table, based on atomic number and electron configuration, was created primarily by a Russian chemist, Dmitri Ivanovich Mendeleev, and a German physicist, Julius Lothar Meyer, both working independently. They both created similar periodic tables only a few months apart in 1869. Mendeleev created the first periodic table based on atomic weight. He observed that many elements had similar properties, and that they occur periodically. Hence, the table's name. His periodic law states that the chemical and physical properties of the elements vary in a periodic way with their atomic weights. The modern one states that the properties vary with atomic number, not weight. Elements in Mendeleev's table were arranged in rows called periods. The columns were called groups. Elements of each group had similar properties. The alkali metals, found in group 1 of the periodic table, are highly reactive metals that do not occur freely in nature. These metals have only one electron in their outer shell. Therefore, they are ready to lose that one electron in ionic bonding with other elements. As with all metals, the alkali metals are malleable, ductile, and are good conductors of heat and electricity. The alkali metals are softer than most other metals. The alkaline earth elements are metallic elements found in the second group of the periodic table. All alkaline earth elements have an oxidation number of +2, making them very reactive. 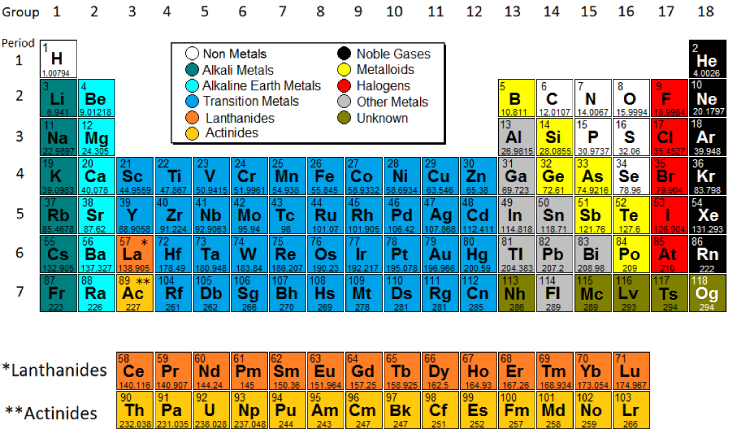 The 38 elements in groups 3 through 12 of the periodic table are called "transition metals." As with all metals, the transition elements are both ductile and malleable, and conduct electricity and heat. Their valence electrons are present in more than one shell. This is why they often exhibit several common oxidation states. The "other metals" elements are located in groups 13, 14, and 15. While these elements are ductile and malleable, they are not the same as the transition elements. These elements, unlike the transition elements, do not exhibit variable oxidation states, and their valence electrons are only present in their outer shell. All of these elements are solid, have a relatively high density, and are opaque. They have oxidation numbers of +3, ±4, and -3. Metalloids are the elements found between the boundary that distinguishes metals from non-metals. Metalloids have properties of both metals and non-metals. Some of the metalloids, such as silicon and germanium, are semi-conductors. Non-metals are the elements in groups 14-16 of the periodic table. Non-metals are not able to conduct electricity or heat very well. As opposed to metals, non-metallic elements are very brittle. The non-metals can be gases, such as oxygen and solids, such as carbon. The non-metals have no metallic luster, and do not reflect light. They have oxidation numbers of ±4, -3, and -2. The noble gases are found in group 18 of the periodic table. These elements have an oxidation number of 0. This prevents them from forming compounds readily. All noble gases have 8 electrons in their outer shell, making them stable and highly non-reactive. Rare earth elements which are useful for their metallurgical properties in alloy form are composed of the lanthanide series plus Scandium and Yttrium. The Actinides series consist of the elements in the f-block in the seventh period of the periodic table. All the elements of Actinides series are radioactive and most are synthetic, that is, human-made. All have a silvery or silvery-white luster in metallic form. When elements are arranged in order of increasing atomic number, there is a periodic repetition of their physical and chemical properties. Some of these properties include atomic radius, electronegativity, ionization energy and metallic characteristics. Factors affecting these properties include the number of protons in the nucleus, the distance from the nucleus and amount of shielding inner electrons provide to the valence electrons. The atomic radius is a somewhat imprecise measure that can refer to the mean distance from the center of the nucleus to the boundary of the surrounding electron cloud. We can determine the radius by dividing the distance between two bonded atoms in half. Depending upon the type of bond we can obtain very different values. If the bond is covalent it is called a covalent radius. If the bond is ionic it is called an ionic radius. The Atomic radius tend to decrease when moving across a period from left to right. As we move across a period electrons are added to the same energy level and protons are added to the nucleus; increasing the effective nuclear charge and pulling the electrons closer to the nucleus. The Atomic radius tend to increase when moving down a group from top to bottom. As we go down a group additional energy levels are added; and each subsequent energy level is further from the nucleus. Electronegativity is the tendency of an atom to attract electrons. It cannot be measured directly and needs to be computed from other atomic properties. The Pauling scale is a dimensionless quantity developed by Linus Pauling used to describe the electronegativity of an atom. The two key factors in determining electronegativity are its atomic number and radius. Fluorine has the highest electronegativity and francium the lowest. If the electronegativity difference between two atoms is very large, then the bond type tends to be more ionic, if the difference in electronegativity is small then it is a nonpolar covalent bond. The first ionization energy is the energy it takes to remove an electron from a neutral atom in gaseous phase. In general, the 1st ionzation energy increases as we go across a period; as the electrons are held closer to the nucleus with the increasing effective nuclear charge. In general, the 1st ionization energy decreases as we go down a group; as the electrons are further from the nucleus with each increasing energy level. The noble gases possess very high ionization energies because their full valence shell makes them highly stable. In general, the (n+1)th ionization energy is larger than the nth ionization energy. Metals are usually shiny, malleable, hard and are good conductors of electricity and heat. Metals have low ionization energy and low electronegativity which allows them to conduct electricity as electrons can flow through them easily. Metal characteristics tend to increase when moving from the top-right to bottom-left of the periodic table. The most nonmetallic elements(oxygen, fluorine, chlorine) occur at the top right of the Periodic Table. 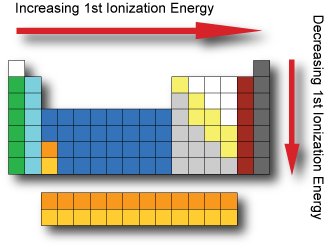 The periodic table can be divided up into several blocks based on their highest energy electron orbital type. There are 4 types of electron orbitals; "s" which can hold 2 electrons and is sperical in shape, "p" which can hold 6 and is shaped like a dumb-bell, "d" which can hold 10 and "f" which can hold 14. For example Helium has an electron configuration of 1s2; the "1" denotes the energy level or shell (also known as the principle quantum number "n") the "s" the type of orbital and the "2" denotes the number of electrons. The s-block consists of the groups 1 and 2 elements plus Helium. The p-block consists of the groups 13 to 18 elements but not Helium. The d-block consists of the groups 3 to 12 elements. The f-block consists of the Lanthanides and Actinides. We can also divide the table between main group and transition metals. 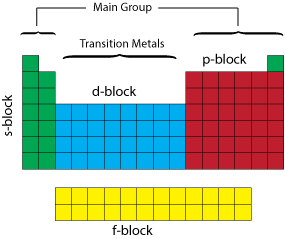 The main group elements include groups 1 and 2 (excluding Hydrogen) on the left of the periodic table and groups 13 to 18 on the right of the table. The transition metals are the metallic elements that serve as a bridge, or transition, between the two sides of the table. The lanthanides and the actinides at the bottom of the table are sometimes referred to as the inner transition metals.